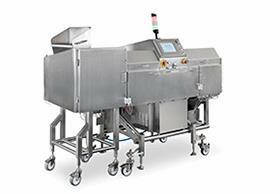 Operators of the RAYCON H+ BULK benefit from the cleaning & maintenance time reduction due to the outstanding hygienic design. The heart of the RAYCON H+ BULK is a high performance industrial PC incorporating a real-time operating system and sophisticated image processing software featuring user administration, multi-product memory, etc. Operator input and set up is via a 10“LCD touch screen monitor.